Amado are solid wood panels. 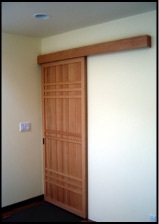 Traditionally they were used as exterior shutters to secure the traditional Japanese home from the elements. The Amado are made of solid lumber and feature vertical boards, 4 to 6 inches wide, joined together with discretely visible splines, and generally overlayed with 5 to 8 batts. Amado can be made in any wood type Pacific Shoji Works offers. 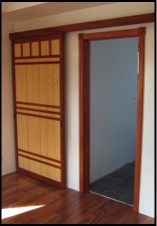 Interior Amado can be used as passage doors, pocket doors, closet doors, or room partitions. These unique designs offer the warmth and function of solid wood doors. 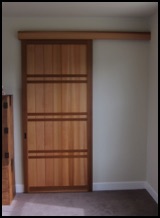 Amado panels can work very well in the Mid-century modern home.